We came back from Inspire Create Share 2015 with some loot! Most of it was Christmas and fall stuff, but Stampin' Up! has really made an effort this year to make their seasonal stamp sets and Designer Series Paper more versatile so that it can be used for other occasions and give you a little more bang for your buck. Today I am showcasing 3 new products, all seasonal, but showing you how they can be used all year long. The two stamp sets used here are Your Presents*and A Little Something*. The Designer Series Paper is called Season of Cheer* and features hand painted Christmas designs along with more generic water-coloured patterns. The stamp set, Your Presents*, is designed to be used with the "kissing technique" and you can see two instances of that here. For the Lost Lagoon present, I inked up the present stamp with Lost Lagoon and stamped off once. I then pressed the clean tree patterned stamp onto it and it removed ink where the trees were to give this negative pattern. The Hello Honey plaid present was made the opposite way. The solid square stamp was clean and I inked up the striped stamp with Hello Honey ink and pressed onto the solid stamp to leave a striped pattern in one direction. I inked up the stripes again in Hello Honey and pressed it onto the solid square in the opposite direction and stamped it on some Whisper White cardstock to give this plaid design. This technique was shown to us at Convention by Genevieve Ko, one of Canada's top demonstrators. I added some Venetian Crochet Trim, which I actually won as part of a Prize Patrol (shock of my life) to a piece of the Season of Cheer Designer Series Paper* which all attendees scored! 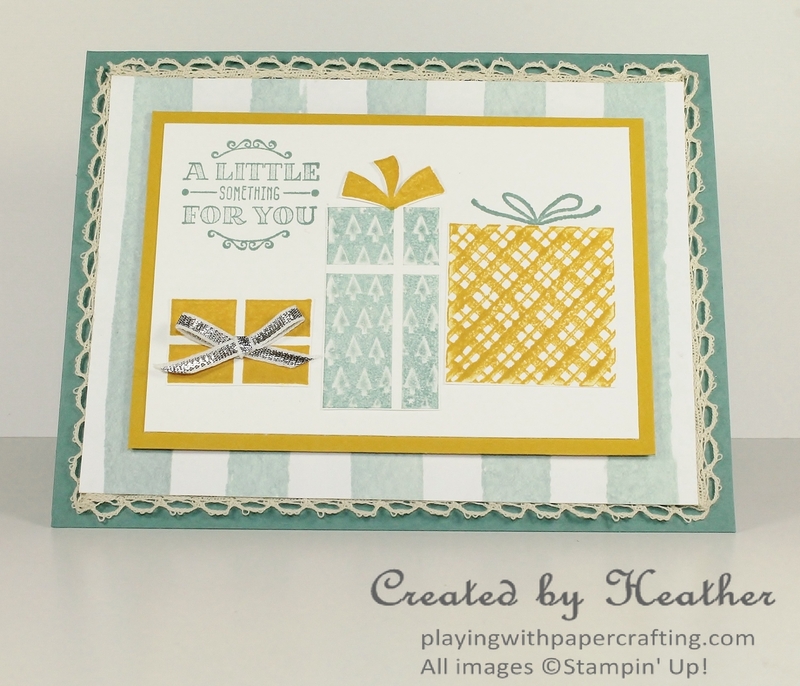 It features water-coloured stripes in Soft Sky for this card. 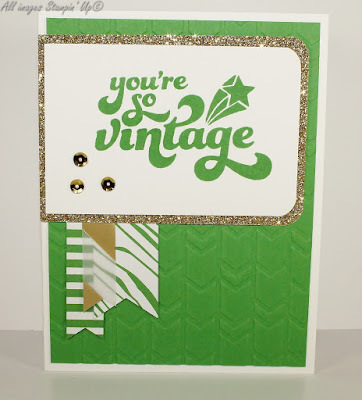 I love, love, love this card from Leslie Irvin of Albuquerque, NM using the You're Sublime stamp set. 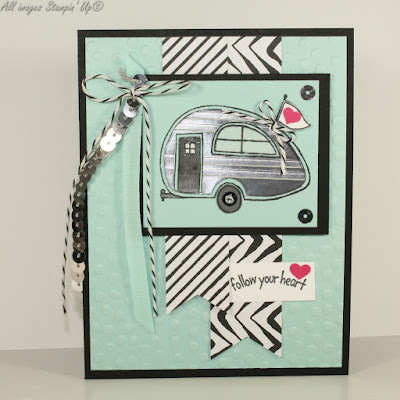 The color scheme is so striking as well as the animal prints and the silver paper piecing on that adorable trailer! 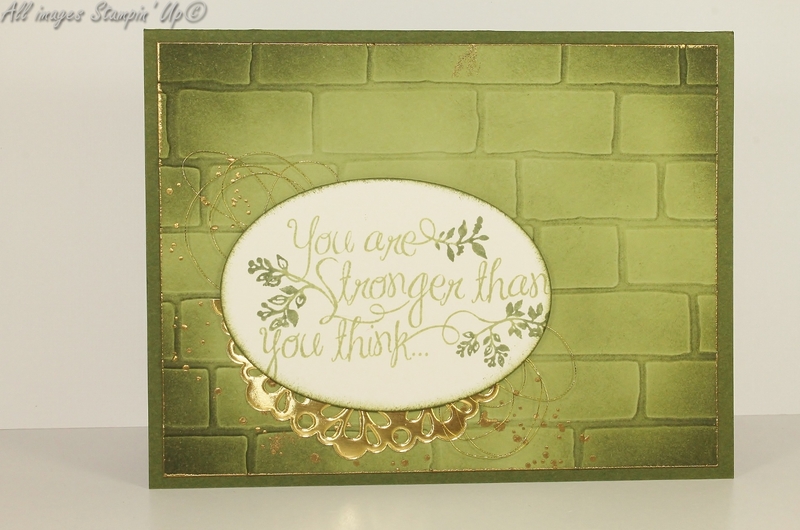 My up-up-line, Desirée Spenst, created this beauty using the Heartfelt Sympathy stamp set along with the Brick Wall Embossing Folder. I love the sponging and the touches of gold everywhere. 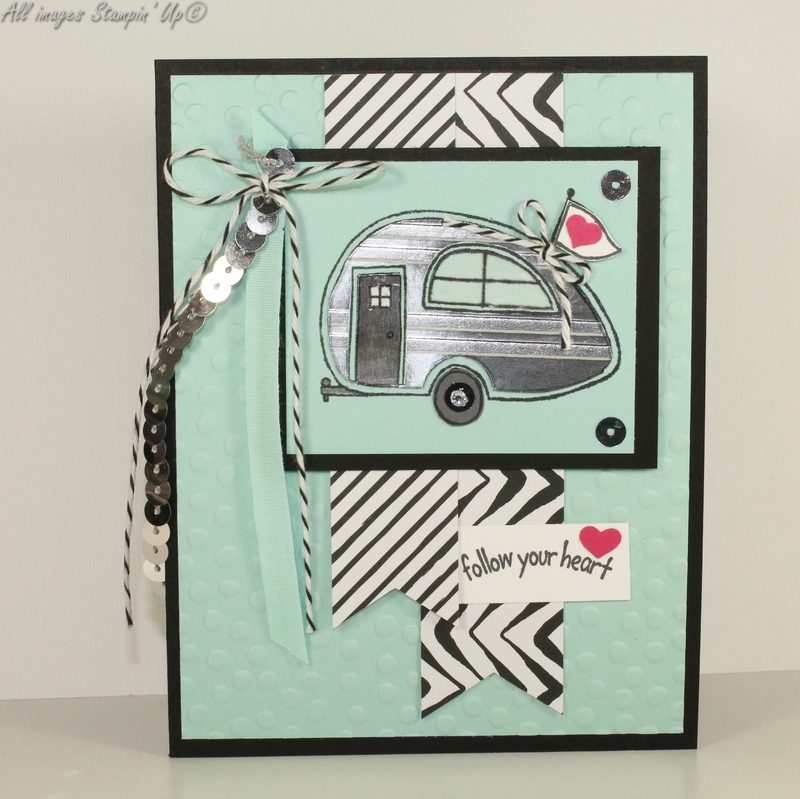 One of my Stampin' Up! friends from Michigan, Tara Angus, created this funky design! Don't you love the Cucumber Crush with gold accents! I also like that she took the woodgrain design from the In Colour Envelope paper and cut it so that it looks like zebra stripes! She used the stamp set, That Thing You Did! 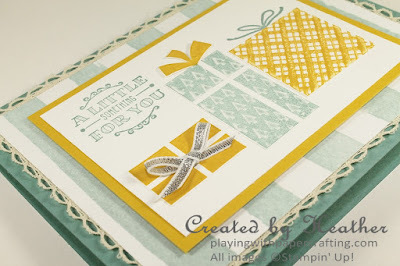 Finally, this card by Cindy Castleman is epic! 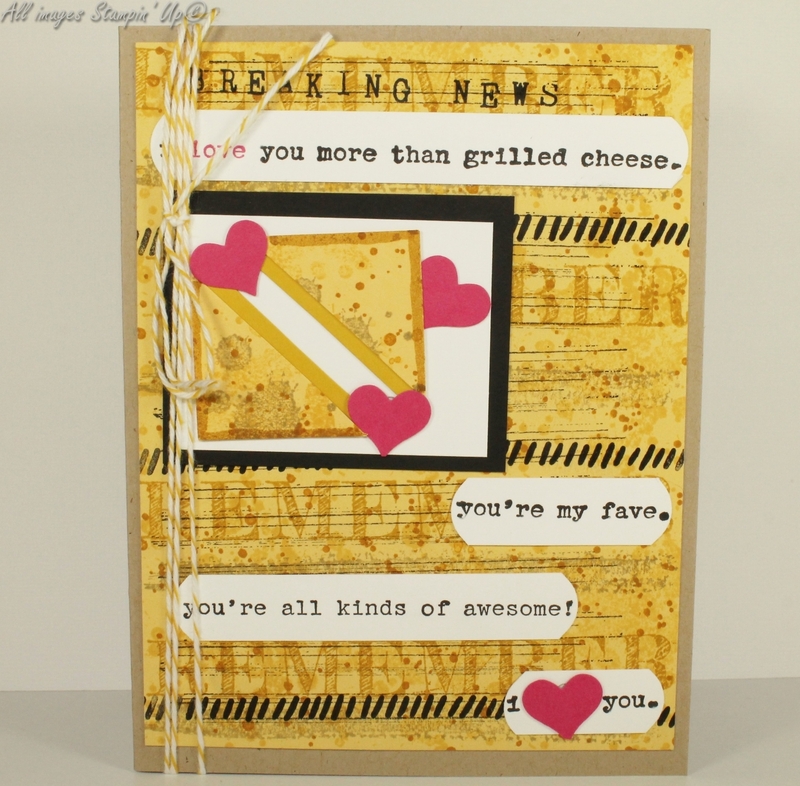 The stamp sets she used are Words of Truth and Gorgeous Grunge, but I can't believe how the whole card somehow looks like a toasted grilled cheese sandwich! So awesome! 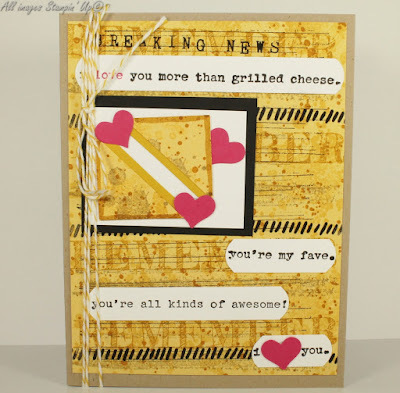 So these are the kind of perks you get from attending Stampin' Up! events! I'd love to take you with me next year! Why not join my team?! 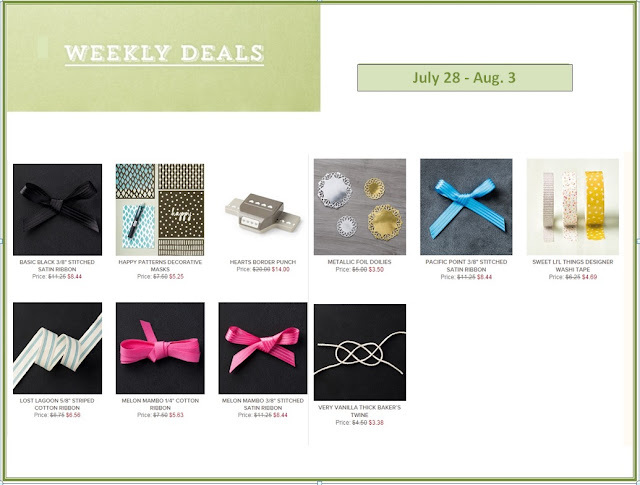 And it's Tuesday and time for new Weekly Deals! Remember during the month of July, there are more and better deals, but they are time sensitive! You have to act fast. Contact me if there is something you'd like to order, or go to my On-Line Store and order 24/7!